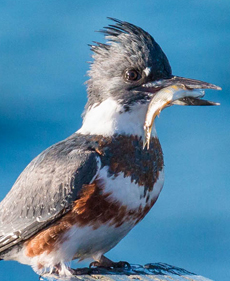 For better and for worse, humans can have a huge impact on the lives of birds. 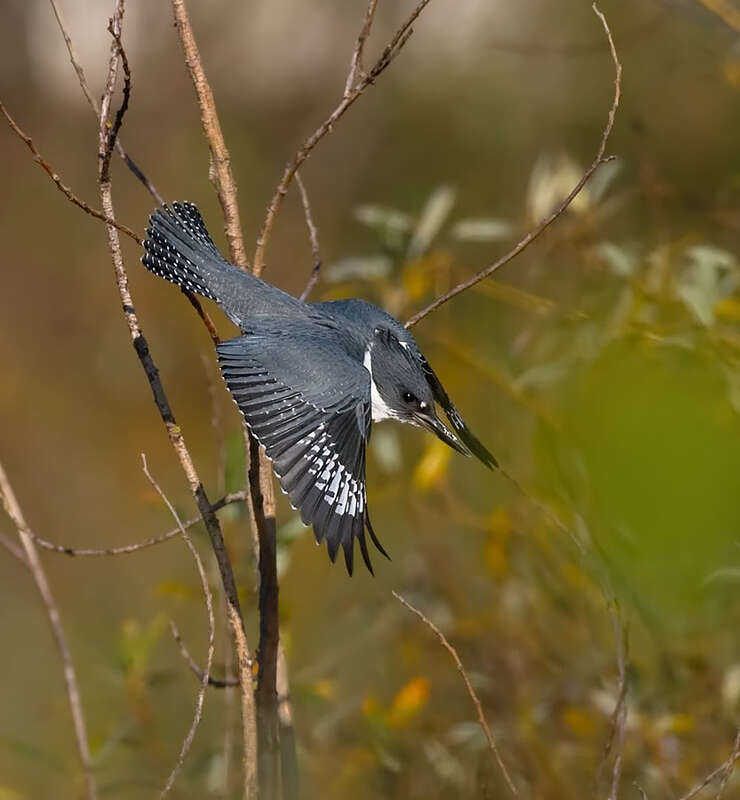 One positive impact for Belted Kingfishers is that some road building and digging of gravel pits has created banks where the birds can nest and thus allowed the expansion of their breeding range. 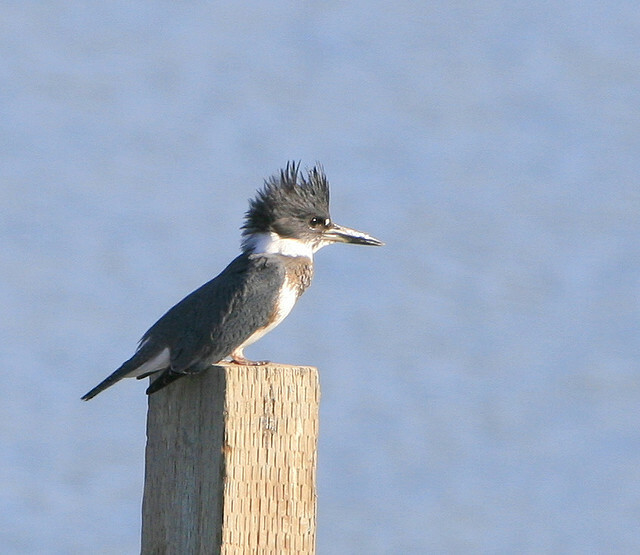 * But increased development of shorelines has often meant the removal of snags and shrubs, natural perches upon which the kingfishers watch for their fishy prey. 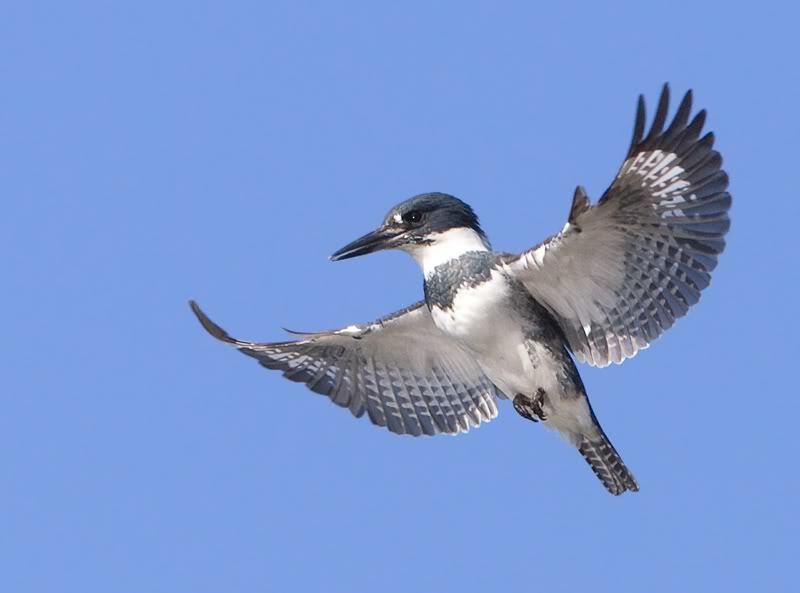 Jennifer and Marc had a resident Belted Kingfisher that regularly sat on an old rusted boat davit, a small crane for hoisting boats out of the water, on the property next door. 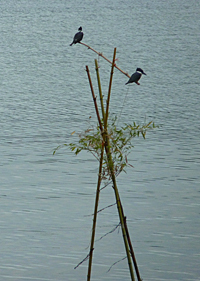 The neighbors decided that they wanted to be rid of the old derelict, but where would the kingfisher sit? 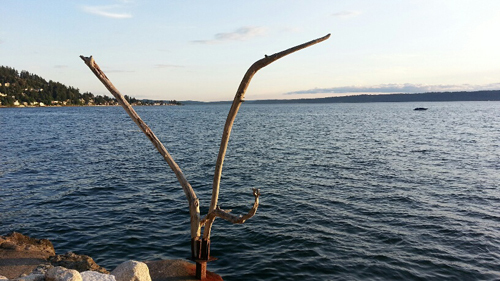 Jennifer and Marc harvested weathered and graceful tree branches tossed up on the beach by winter storms. Then they asked a welder to come and fabricate a stand on the neighbors’ land, right where the old perch had been. 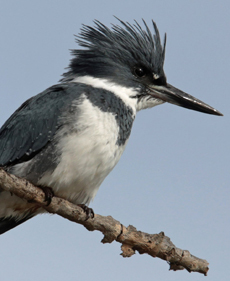 Kingfishers can be stubborn – or suspicious – because it took awhile for them to adapt to the new sculpture. But they’re back, and everyone enjoys watching the fly-by show again. As Jennifer says, "The tripod perching post shows that humans and birds can coexist — and we can benefit from each other." 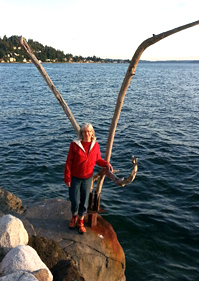 On the other side of Puget Sound, near Kingston, Linnea and Jim struggled with a kingfisher pole that routinely washed away during winter storms. Enter their friend Bruce Fogel of Pacific Grove, California, on a visit. Linnea put him to work designing a sturdy new perch. 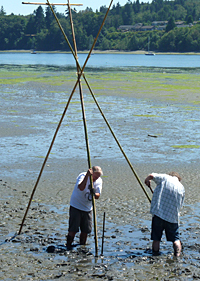 Using tall bamboo stakes from their property, Bruce created a three-legged teepee-style structure, complete with bamboo leaves. At low tide, Bruce and Jim dug down in the goop (Linnea’s term) and secured the perch. 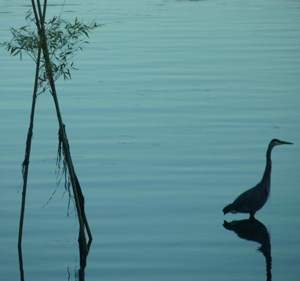 Now, a heron is often seen foraging nearby and a goose occasionally swims through the legs. 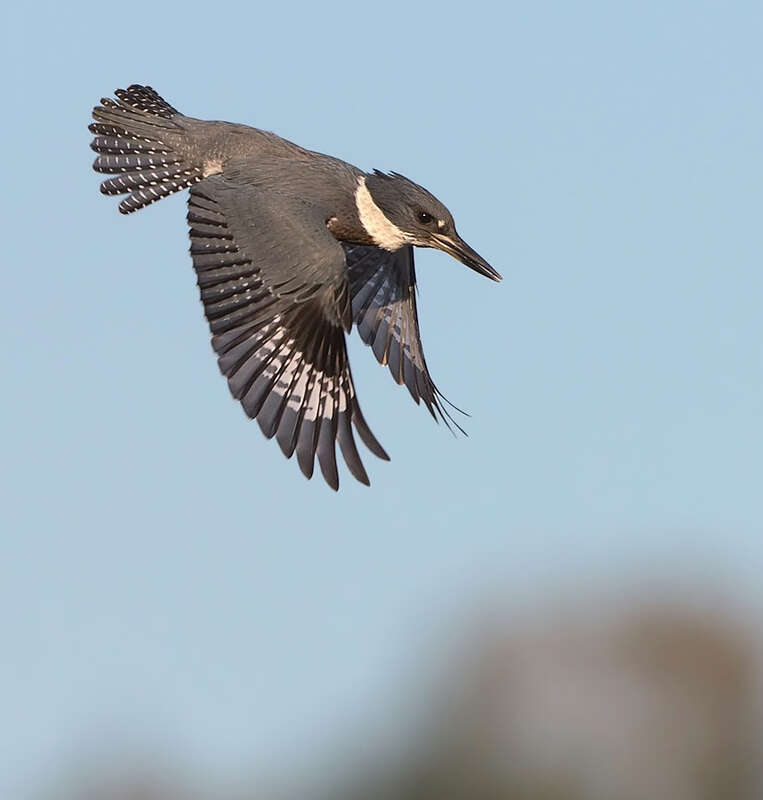 Best of all, the kingfisher family took to it immediately, diving for fish which they then bonk (also Linnea’s term) on the perch. Happy kingfishers. Happy people. 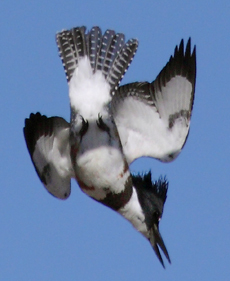 Thank you, Jennifer, Marc, Linnea, Jim, and Bruce, for looking out for these gorgeous birds!